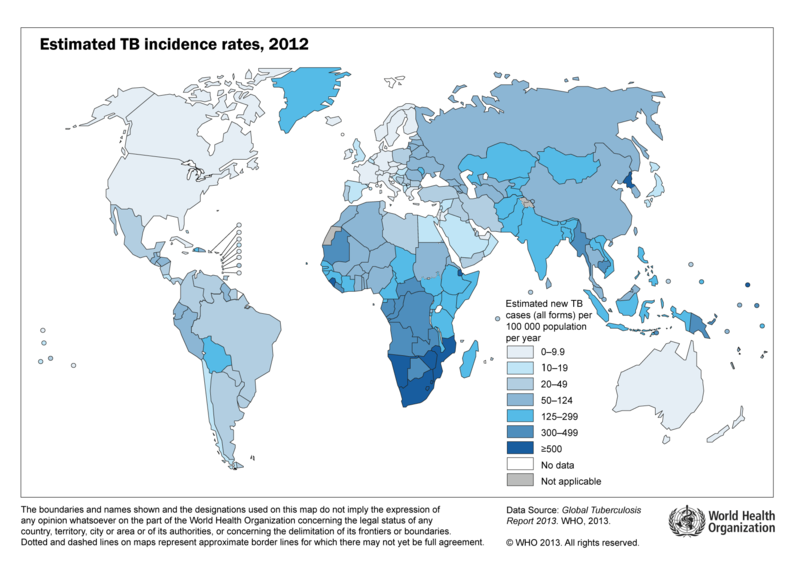 Data Source: Global Tuberculosis Report, 2013. WHO. An active TB disease is defined by specific laboratory and clinical criteria (which include demonstration of the bug in a clinical specimen and presence of symptomatic disease), and requires prompt and adequate treatment. However, exposure to, and infection by, M. tuberculosis may not always lead to an active disease, a situation referred to as LTBI. People with LTBI are not ill, and cannot spread the disease, because the bug is dormant or inactive in their body. LTBI is diagnosed by blood tests which reveal that a person’s immune system, having been exposed to TB antigens, is primed and ready to respond. In fact, it may be their healthy immune system which keeps the bug in check. However, such people may develop TB disease in future (a process called reactivation) if their immune system becomes weakened for some reason. Therefore, specific types of long-term treatment are recommended for people with LTBI, which can kill the dormant bugs. Standard anti-tubercular drugs represent an effective arsenal for the treatment of TB disease; however, their mode of use has evolved with time in terms of both number of drugs used simultaneously and the time of treatment. But a crucial fact in this matter is that the decades-long use of the standard anti-TB medicines across the world has given rise to the problem of growing resistance to these drugs, mainly due to inappropriate or inadequate treatment. According to WHO (Cf. Fact sheet linked above), TB strains showing resistance to at least a single drug are documented from every country surveyed, and multi-drug resistant (MDR)-TB (by definition, resistant to the standard drugs isoniazid and rifampicin) is by no means unknown. In 2012, about half a million people in the world – predominantly from India, China and the Russian Federation – developed MDR-TB; in the United States, 72 cases were recorded. Twenty-seven countries in the world have been designated by WHO as “high MDR-TB burden” (PDF report), which would collectively require a projected treatment cost of US$1.2 billion in 2015 alone. MDR-TB is curable via second-line drugs; however, these drugs have significant problems (availability, potency, undesirable toxicity, and so forth) associated with them at present. But an even more critical scenario is posed by the threat of extensibly drug-resistant (XDR)-TB (by definition, MDR-TB strain resistant further to fluoroquinolones and any of the second-line injectable drugs). In the United States, 63 cases of XDR-TB have been reported between 1993 and 2011. Globally, 92 countries have reported XDR-TB by 2012, with at least 1 case of XDR in 10 MDR-TB cases, and some of the highest proportions coming from the Russian Federation nations (PDF report). Countries of the world, in association with the WHO, have put in place their strategies for TB prevention by various means; the US CDC is active in the TB control programs of many countries. Even with XDR-TB, it is estimated that a third to more than half of the afflicted can be treated successfully; in addition, there is a concerted attempt to repurpose for TB treatment older drugs against which resistance has not developed. At the same time, search for novel chemotherapeutic agents and new drug targets is on. And this also brings me to a fascinating paper published this week in Nature Communications (Bhowmick et al., vol. 5, Article: 4124, 2014) by an Indian group from the prestigious Indian Institute of Science, Bangalore, about a putative novel drug target for TB. First, a little background. We know that an eukaryotic cell contains a membrane-covered nucleus which houses most of the genetic material of the cell. In contrast, the more primitive prokaryotic cells (such as bacteria) have the nucleoid, a specific region of the cell where the genetic material is amassed, with no cover. Again, inside the eukaryotic nucleus, special proteins called histones play an important role in packaging the DNA into ordered sets. Prokaryotic cells, lacking histones, depend upon special DNA-binding proteins, called nucleoid-associated proteins (NAP), which organize the bacterial DNA spatially by compacting it via looping, bending, clustering and so forth. NAPs are also involved in coordinating (as well as regulating) major DNA events, such as replication, transcription, recombination and repair, in bacteria. One such NAP, a small two-part (dimeric) protein called HU (a.k.a. HupB), is well-studied in various bacterial species, and is known to perform essential functions including gene regulation. Interestingly, the HU homolog present in the TB bug, M. tuberculosis, is considered essential to its growth. The authors of the study observed that regardless of its importance, the Mtb HU (I was tempted to call it “HUMtb”) wasn’t being considered as a target for drug action. They sought to bridge this gap via this elegant study. Using standard recombinant molecular biological techniques, they purified the Mtb HU protein and made it into crystals, which they studied using X-ray. This revealed the structure of the dimeric protein and helped them visualize how it binds to DNA and performs its DNA manipulation functions. They allowed the Mtb HU to bind to intact and variously damaged DNA strands, and observed its action via biophysical assays. When they put the protein back in ample quantities into a different type of mycobacteria, they could see (via electron microscopy) how it bundles up the nucleoid in a tight compact. Using predictive computational techniques and simulations, they mapped out the physico-chemical interactions that guide the binding and manipulation of DNA by Mtb HU. Interestingly, they found that these functions are remarkably similar for HU proteins from other non-mycobacterial microbes as well. How to disrupt this interaction? Structure-based inhibition is one strategy of functional inhibition of biological interactions. We can think of it as jamming a different, non-relevant (non-specific) key into the keyhole of a lock, so that the real key, specific to that lock, cannot operate. In the living system, drugs and inhibitors that disrupt binding interactions have to be sufficiently sized (in terms of molecular weight) and specific to the extent of fitting snugly – and interacting with the amino acids on the surfaces – inside binding pockets, thereby preventing the real substance (ligand) from binding. Knowing the structure of the Mtb HU DNA binding site, the authors looked for small molecules, including proteins, that could mimic the binding of DNA to HU’s groove, and identified a set of 36 compounds to test if they can prevent Mtb HU-DNA interactions. They were able to pick two related substances (named SD1 and SD4), both derivatives of stilbene (a small molecule with two phenolic rings), which showed the most potent inhibition of DNA binding; these were also able to inhibit the growth of a common laboratory strain of Mtb in an in vitro assay, and microscopy showed that treated cells had a diffuse – as opposed to the HU-mediated compactness – nucleoid. In further studies with SD1 (the molecule to which Mtb was more susceptible), the authors confirmed its binding to Mtb HU via NMR-spectroscopy (nowadays a common tool to study conformation/structure-activity relationships), which provided indications of the formation of an SD1-Mtb HU complex. In order to study the molecular structure of SD target sites, they introduced several mutations in the core binding region, each of which reduced the strength of Mtb HU binding of both SD molecules and DNA – an indicator of the specificity of SD for Mtb HU. The specificity was further corroborated by the observation that SD presence did not inhibit the interaction of DNA with other, non-HU NAPs. The authors also conducted a separated set of experiments to establish the essential nature of HU in Mtb, thereby establishing the validity of HU as a drug target in Mtb. Generally, new drug discovery approaches shy away from protein-protein interactions outside of enzyme-ligand and antibody-antigen paradigms, because of certain features of such interactions – such as conformational changes in proteins – which make drug targeting difficult. However, the mutagenesis studies performed by the authors identified a small “core” region for HU-inhibitor interaction, alleviating many of such concerns. As long as HU is critical to growth [Note: the authors found it not growth-critical in a different mycobacteria, called Mycobacteria smegmatis, as well as in E. coli], the inhibition of HU-DNA interaction should work against the microbe. The conserved nature of core HU sequence (as well as function) across various mycobacteria and other bacterial pathogens such as Nocardia provides the most interesting rationale for developing a new generation of antimicrobial agents that target NAPs. An interesting side-note about Mtb HU is that it appears to be immunogenic and able to elicit a vigorous cellular immune response in healthy people. However, the immune response was found to be reduced in TB patients. Mtb HU, much like the eukaryotic histone H1 (with which it shares sequence similarity), is recognized by certain auto-antibodies (Anti-neutrophil cytoplasmic antibody, or ANCA) implicated in the syndrome of inflammatory bowel disease (IBD, including ulcerative colitis and Crohn’s disease), leading to the interesting speculation that gut-resident mycobacterial population may be associated with the pathogenesis of IBD. The principle explored in this study is sound, the experimental design elegant, and the work laudably thorough and ground-breaking; a molecule such as these stilbene-derivatives should theoretically work with ease against even mycobacterial strains that have become resistant to standard anti-TB drugs. However, this study needs to be followed up with more and extensive studies to establish in vivo efficacy, biological availability, and safety of such HU-inhibitory molecules. The curse of new drug discovery efforts is that too many times, umpteen compounds that yield promising results in vitro fail to pan out at immediately later stages. This fact of life should temper and inform our enthusiasm. The scientists who designed and performed this excellent work know that; however, the media outlet where I first came across the news of this study was already gushing about a “killer discovery to fight multiple drug resistant TB bacteria”. We don’t really know that, yet.